Category Archives: let’s all go to Jamaica! When a man/s invites three of her husband’s female friends from college to join them on an all expense paid trip to Jamaica to celebrate the husband’s birthday, you know – YOU KNOW – drama will ensue. Dwight Glass was a gigantic nerd back in college, so much so that he was virtually ignored by everyone. Well, everyone except Allie, who saw in Dwight a kind, good hearted man. That Dwight eventually becomes Bill Gates-ian in his accomplishments should be the ultimate revenge. But Dwight’s too good of a guy for that. His brittle wife Pauline decides to throw him the 40th birthday of his – or her? – dreams. She gamely invites Allie, along with Dwight’s other two college pals, Tina and Savannah, and their husbands. Each woman comes with her own burdens, even Pauline. She knows that her marriage to Dwight is not the stuff of fantasies, and her own hard won successes teeter on her unstable family history. Allie at first appears to be too perfect. She anticipates harried mother of four Tina’s every need, going so far as to help with laundry and childcare. She champions Dwight. She adores her husband. But yet the more we get to know her, the more unlikable she becomes. What begins as a predictable character turns into something else entirely. With her four young children and contractor husband, Tina lives under constant strain. Her husband’s business is not as successful or secure as they would like, and the exhaustion that comes with parenting four kids overwhelms her at times. She has no small amount of insecurities, yet, as with Allie and Pauline, she will surprise you. Finally, there is Savannah. Taught, toned, surgically enhanced Savannah, whose doctor husband recently left her for a nurse. She undoubtedly feels desperate, whether to prove her desirability or her independence. Savannah’s reluctance to tell her friends the truth about her marriage stems not so much from her embarrassment at having been dumped as from her shame at suffering any amount of pity. She’s hurt, which makes her dangerous. Here, again, Pekkanen zigs when we expect her to zag. In many ways Savannah is the least likable of the four women, yet I rooted more for her than the other three. Her vulnerability is real and we feel it. 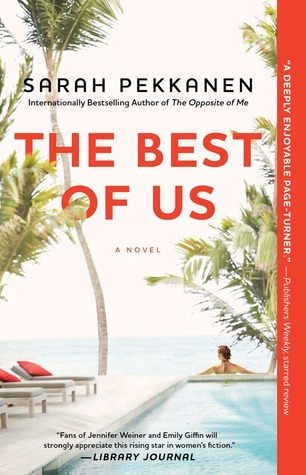 Seven people together in a beach house in Jamaica for a week is fertile ground for storytelling, and Pekkanen doesn’t disappoint. She presents her characters as flawed individuals, but she demands that we care about them. Jamaica, too, is a character, infusing the novel with a steamy, laid back facade that disguises its dangers and anxieties. This is a fantastic beach read. Filed under chick lit, let's all go to Jamaica!